A lot of hen parties go for something to eat after a fabulous hen day or before a crazy hen night out, but why not have a delicious meal with a twist? Create your own meals with some fresh ingredients and of course, eat them after. This activity is perfect for any bride to be looking for something a bit different, or maybe just a pizza lover! A pizza making hen do is not just creating pizzas, it provides a complete evening full of food, drink and fun. As soon as you walk through the door you’ll be treated like a princess, with a complimentary glass of Prosecco for all the hens to kick off the night. When you get to your table, they’ll be some nibbles waiting for you to tuck into, just make sure you don’t fill up. Before creating your very own main course, they’ll be dough balls and garlic bread to share for the table while you settle in and maybe order a few drinks. Then the creative fun begins! A trained Pizzaiola Chef will give you a live demonstration to make sure you get the most out of your hen party experience. Roll, toss and throw your dough into a variety of different shapes, and have fun with this unique activity. All of the girls will get a couple of tries, so don’t worry if your first piece of dough gets a bit holey. 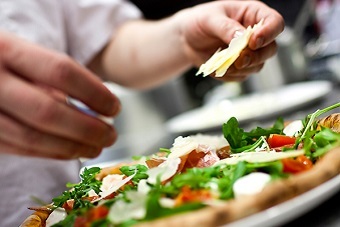 You’ll be provided with completely fresh ingredients to top your pizza which with cater for everyone’s tastes, so it’s your choice whether to create a simple pizza or go wild with every topping. While your pizza creations are cooking, your hen group will be split into two teams for the hilarious calzone challenge. We won’t tell you too much, but it’s completely yummy and there will be certificates for the winners so make it count! Your finished calzone will also be put in the pizza oven to enjoy later. You’ll get a bit of time to relax and chat at your reserved table before your pizzas come out and you can get stuck in. If all the food you’ve made isn’t enough, additional food and drink can be purchased on the day so you can make your hen party completely perfect. By having a pizza making hen party, you’re adding some fun to a delicious meal that are bound to create memories for the future! If a pizza making hen party is the one for you, let our events planners help you out and call us on 0161 341 0052 if you just want more details on this tasty hen party, or you’d love the whole thing organised for you.